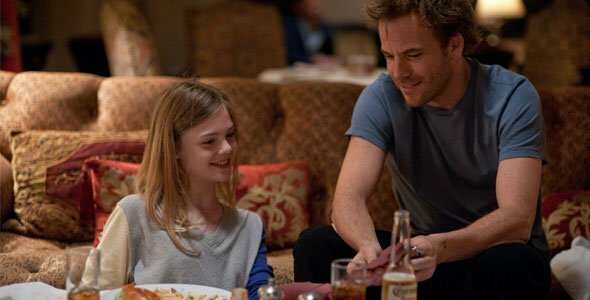 I had the pleasure of talking to Stephen Dorff a few months ago about another film, but all he wanted to talk about was Sophia Coppola’s Somewhere. Ever since, I’ve been particularly anxious to see the film that he said set a new standard for him and now the time has finally come and Somewhere is hitting theaters. Dorff stars as Johnny Marco, an actor caught between jobs. His schedule is pretty bare so he spends his time driving around town in his Ferrari, chain smoking, drinking and watching his two favorite exotic dancers, blond twins that come fully equipped with their own portable stripper poles. Johnny is ripped out of this haze when his young daughter, Cleo (Elle Fanning), stops by for an unexpected business. Turns out her mother opted to split and now it’s up to Johnny to rearrange his priorities and fit Cleo into his life. 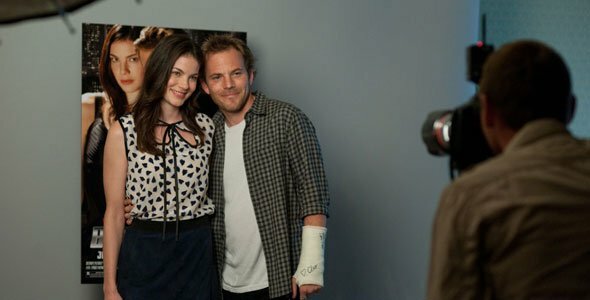 Somewhere isn’t just any old movie for Dorff; it was a truly special experience. He even said, “I’ll have to wait until Sofia hires me again to have fun again.” Well, he’s certainly enjoying this fun while it lasts because during a roundtable interview, Dorff took the opportunity to tell us all about every aspect of this production from his preparation, to working with Coppola and Fanning and even what it’s like making a head cast. Read all about that and more in the interview below. Did they give you any rules when driving that Ferrari? No sharp turns? Stephen Dorff: No, I had this cool guy that I worked with on the driving stuff we did. He did Public Enemies with us. He’s a great driving instructor and we just worked on that track and got it going. How was it working with Sofia? Did she give you a lot of room to contribute and try some improv? From the beginning she made me like her partner. She’s like the way she is when you interview her; she’s a very soft spoken, kind of elegant, nice lady and at the same time very specific, very detailed, the most detail oriented director I’ve ever worked with and very specific on what kind of a film she wanted to make, this intimate portrait of this guy and it was awesome, the whole experience. You do some improv sometimes because a certain scene will be one line. It’ll say we’re playing Guitar Hero in the hotel room and that scene will end up being like five minutes. A lot of that we make it up, but then a lot of the scenes were very much scripted and very specific. The little dialog that we had was very specific. How much of this character did you bring in from people you know or from your own experiences as an actor? I asked her all those questions in the beginning and she didn’t want me to do a version of myself or she didn’t want me mimicking anybody else. She really wanted to create this kind of iconic movie star that she had in her mind, Johnny Marco, and so it was about using certain things that I could identify with - the loneliness, sometimes the emptiness of a performer or of an actor when you finish your gig and everything stops. It’s a very on and off job being an actor, so I like how she chose to see the character in the in between moments; not necessarily shooting a movie, but what’s it like to wake up and get a call and have to go get your head cast? Just the weird things that we might have to do sometimes. What’s it like to run into an actress that you probably haven’t seen for a year but you obviously had an affair with while you were making The Berlin Agenda? She’s so good with awkwardness and real life, whether it’s me and Benicio [Del Toro] in the elevator. It’s a movie that I think at the heart is about this adolescent father becoming a man and then all the other stuff is all these awkward moments, vignettes, that help drive the story. Did you make a back-story in your head? Speaking of your daughter, how was it working with Elle Fanning? Sophia gave us the space in the beginning to just hang out together and get to know each other without her even hanging around with us. She was so smart, Sofia, to do that because usually if we’re hanging out, the director wants to be there. She really gave us our space to create our own trust so that when it came time to getting on the set you could take us in any direction; we were a team. And a lot of that stuff with Chris Pontius and Elle, all those crazy reactions she’s giving because he’s so crazy and saying the craziest stuff, I think a lot of that was improv between them. What was it like living at the Chateau Marmont? It was cool. I basically checked in as Johnny Marco and I stayed there for about seven weeks. At the beginning of the movie I wanted to live quite rough, I wanted to look kind of screwed up and really be out of it, so I lived pretty hard. And then I thought he slowly wakes up, he should start looking more fresh, he should start becoming clearer. But obviously it was the perfect creative thing; I’d just leave my room and go right down into Johnny’s bed. There’s so much mythology around that hotel from old Hollywood to new Hollywood. Do you have a favorite piece of Marmont lore? There are so many great crazy stories. I found out in the room where we shot, Johnny Marco’s room 59 and I guess that was the room that Hunter Thompson cut his hand and smeared blood all over the wall and did this painting with his own blood. There’s a story with each room. So many people are like, “Oh my god, I stayed in 59. I asked my wife to marry me in that room.” These stories that even people at the premier were coming up and telling me. It’s just kind of one of those hotels where if you’ve had your personal experience, if you went there 10 years ago to do a story or you were doing an interview, you see our movie and I think you completely identify with being there. You can almost smell the place and she got the sounds of the elevator right. Just the whole hotel is so much of a character in this movie. Between the Ferrari and the hotel you could argue which should get billing because they’re fighting for third and fourth billing I think. Did you take a cue from any older movies when making this one? Did these sustained takes shift a lot of the responsibility to you? There isn’t much you can do with those in editing. Yeah, it’s a very naked part. It’s the most raw I’ve ever been. There’s no tricks, there’s no big speeches, there’s no accent, there’s no banks to rob, there’s no explosions. There’s nothing happening except my behavior, so if I start acting or if I’m conscious of the camera I think it’s going to unravel this movie and what Sofia wanted to do. It was a very awkward balance to walk because it would have stood out like a sore thumb if I’d been mugging for the camera. At the same time, it’s very self-conscious to have nothing happening. The award ceremony in the film, was that real? That’s actually based on a real awards [show] called the Telegatti Awards that Sofia had gone to with her father. It’s kind of like the TV Guide awards in Italy, but they give an award to a legendary filmmaker or star every year. Since Sofia and Francis went, they cancelled the award ceremony so it’s not on TV anymore. So, Sofia really wanted to recreate this so she even found those cats, she found those in storage, and they kind of recreated the whole set and we got all these Italians and all the crazy TV presenters from Italy that would normally be there. It’s kind of a show that a new Italian culture would just kind of, not the most incredible part of Italy, but it’s this kind of cheesy TV. A lot of people are speculating about how this is about Sofia’s relationship with her father. Did you and Sofia have any conversations about how to manage the relationship between a father and daughter? A little bit. She, being my director, guided me to the place. I had instincts that were sometimes different. I’m used to having words; I wanted to tell Elle more stuff sometimes, like in that helicopter scene when she can’t hear me and I’m saying goodbye. I said, “Shouldn’t I say all this other stuff?” She’s like, “No, I want you to feel all that stuff, but I want you to just say this one line.” It was just things like that that were incredibly difficult to do, but yet in real life I think that’s what she was after was a slice of real life. We don’t communicate everything that we want to and we look back and say, “I should have said this to those guys,” or “I should have said that.” She wanted it to feel like almost totally real. She writes a lot from her own experiences. She put a lot of herself in Cleo, she’s open about that, and she put a lot of herself in Johnny too because she’s writing kind of from a man’s point of view for the first time. Even though she wrote such a great part for Bill Murray in Lost in Translation, that still was kind of through the girl’s point of view, through Scarlett [Johansson]’s character, whereas I think this movie’s really from the guys’ point of view. How were cast in this role? Sofia seems to cast her actors very specifically and I’m sure a lot of people were vying to be in her next film. She said that she was writing another movie, I don’t know what it was, but the Johnny Marco character popped in her head and I was in her head. Then somewhere along the lines of writing that movie, Johnny Marco wanted his own movie, so she changed and took the character and created Somewhere. It was like, in a way, I think the best part I’ve ever been given at the perfect time in my life and then at the same time it was kind of the easiest part; I didn’t even really need to fight for it. It was just this butterfly that landed in my lap. I went to Paris after I read the script, I met with her for about a week, we had dinner and kind of loosely just talked about the movie and then at the end of that week she told me she wanted me to do it. It was pretty awesome. What’s it like going from a setting like this to something grander like Immortals? A nightmare. [Laughs] I just prefer this kind. I don’t know if I’ll ever get an experience like this again just because out of all the movies I’ve made, this was so special. I’ll have to wait until Sofia hires me again to have fun again. Immortals was fine, it’s just a different kind of movie experience. It’s big, green screen and running around in a piece of leather. I had a sword. I had a lot of tricks again, which is always easy for me to act if we have a lot of stuff given to us. I think the thing that was the most challenging about this was I didn’t have anything, so I found this one to be the hardest because this character has to hold you and hold this movie together. And he’s kind of depressing and has everything on the surface, but he’s broken inside. It’s a hard thing to try to hook you, so I just kept trying to hook the audience somehow. How was it doing that film junket scene? Well, actually that was the most surrealist because the other day when we did the junket in LA, when I did my Hollywood Foreign Press conference I was in the same exact room at the same exact table as I am in the movie. And the Hollywood Foreign Press is in the movie, so those are their voices, because Sofia of course gets the real people. So that Russian guy that’s like, “Oh, Johnny, you’re in such good shape,” I don’t know who he thinks he’s talking to because I couldn’t be more out of shape. Maybe I’m in shape physically but he’s a very unhealthy guy. [Laughs] But those were all real questions; she wanted them to come in with their own questions and they came in with them. They ask those kinds of questions don’t they? Oh yeah. My press conference the other day, one of the ladies writes for a magazine about pets, so the first question in my press conference was, ‘Do I have a cat or a dog and what do I think about a pet?’ I was trying to think what that had to do with my movie but it was interesting. Did you actually have your face in that stuff when they were making the head cast? Oh yeah, I had no idea what that shot was they were doing because once I’m in it and it starts to harden, I’m not aware of what that zoom was. As I’m breathing, I’m really breathing and I love that little phone that’s ringing in the background because you feel like, where the hell did everybody go? Are they at lunch? This poor guy’s left alone. That thing’s not fun; those are pretty intense. Any actor that’s had to do a comic book movie or any kind of effects picture probably has had a head cast before. Any time you do any of that stuff you usually have to do a body cast or a head cast, and the head cast is pretty surreal; it’s pretty intense.